It’s hard to believe that a Boss 302-powered ’69 Shelby Mustang, the only one ever built, has stayed nearly unknown for all these years. Now the car has been fully restored to the way Kar Kraft assembled it in 1969. One story has the following version as the reason for the car’s existence. This version says, that near the end of Shelby’s ’65-’70 production run, the plan was for Ford and Shelby to use the exciting new Boss 302 engine as the foundation for a special run of 36 GT350 fastbacks featuring this engine instead of the 351 cu. in. engine they had scheduled for 1969. Essentially, the cars were going to be Boss 302s but in Shelby clothing. Oddly all of them were going to be the same color–Grabber Yellow with black stripes and a black interior. Yet, just to confuse historians decades alter, the prototype was an early production Boss 302 in Acapulco Blue, one of the four available colors for ’69 Boss 302s. It was what car collectors call a “pilot” car, i.e. a car built to test the assembly line to see if they could build the car right before they start cranking them out in earnest. You would think that the solid-lifter, Trans-Am-bred-in-racing Boss 302 would be a shoo-in for the Shelby. After all, hadn’t Shelby himself demonstrated that back in ’68 when Ford brought out the 428 Cobra Jet in the Mustang on April 1, 1968, and very soon after Shelby announced the GT500 KR (“King of the Road”) using that engine? He was quick to capitalize on whatever Ford came up with. Of course Shelby had already upgraded the small block engine once, dropping the 302-4V that he had in the ’68 Shelby GT350 in favor of the 351-4V Windsor, which matched the Boss 302 at 290 hp. But though it sounds bigger, and is bigger in cubic inches, the Boss 302 was the real performance engine of the two, the 351-4V Windsor (named after the plant in Canada where it was built) was a pedestrian engine with ample torque but less high revving ability. The Boss 302 by contrast, was fitted out with all the good stuff: four-bolt mains, canted valves, and a Holley four-barrel riding on an aluminum intake. Ford homologated the Boss 302 for Trans-Am by producing a run of production Boss 302 fastbacks in 1969 and 1970. They also were producing the Boss series in a big block with the big Boss 429 engine in ’69-’70. And scheduled was the Boss 351 for 1971. So maybe it was the change in body style, the idea came too late. Plus Ford already had the Boss 351 planned. Based on the ’71 body style. And to tell the truth, Ford really didn’t need Shelby anymore. Whatever sales commission he was being paid on each Shelby that Ford built wouldn’t have to be paid anymore because Ford owned the name Boss. Also, the name “Shelby” wasn’t working its magic anymore. The ’69 Shelbys, both the GT350s and GT500s, were proving to be dogs in sales. Shelby wrote his mentor, Lee Iacocca, at Ford and requested an end of the Shelby Mustang program. What cars there were still in the pipeline with re-numbered (after getting FBI permission) as ‘70s and dolled up with front spoilers and hood stripes. Now we come to the barn find part. This pilot car escaped. Nobody knows how. The numbers mavens have researched it ad infinitum and determined that, yes indeed, Ford’s Dearborn Assembly plant assembled this Mustang with a Shelby consecutive unit number on May 6, 1969, coincident with ’69 Boss 302 production. 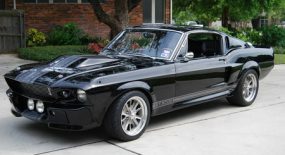 According to the experts, the car carries both a Boss and Shelby VINs, the VIN SN 9F02G482244 having a “G” identifying it as a Boss 302 engine; while the consecutive unit numbers that began with “48” were Shelbys. Plus it shows signs of being a executive order car, i.e. a car made at an executive’s request. That number was DSO number 9999. The Shelby club lists it in their Shelby American World Registry with its G-code VIN that stands out among a sea of M-code (351) and R-code (428 Cobra Jet) numbers in that model year. Shelby by 1969 had actually decamped from his Los Angeles airport factory, the airport harassing him because he was using airport property without having airplanes (they ignored his “gooney bird” DC3) So Mustangs bearing the “48” series i.d. numbers usually went to the firm Ford contracted to make Shelbys, A.O. Smith Company in Southfield, Michigan. However, the researchers at various Shelby clubs have determined that this particular car — 9F02G482244—was diverted to Kar Kraft, a Ford-owned mini-factory that did special projects, such as building (in ’64) the Ford Thunderbolts or later, the Boss 429s. A “999” report from Ford’s Customer Assistance Center revealed that this ’69 Shelby GT350 was built with the following equipment: a 302 H.O. engine, a close-ratio four-speed transmission, a 3.50 Traction-Lok differential, power front disc brakes, an Acapulco Blue exterior paint, knitted high-back bucket seats, F60 x15 tires, a rear sports deck, the deluxe appearance group, an AM/FM multiplex radio, tinted glass, deluxe seatbelts, racing mirrors, a heavy-duty battery, and a tachometer with a 140-mph speedometer. A later owner, who prides himself in his anonymity, is reported to have contacted Carroll Shelby for more information about the car’s raison d’etre. Unfortunately by that time all the engineers Shelby could name, including Shelby-American’s head engineer, Fred Goodell, were deceased so not only couldn’t Shelby himself tell him much about it but he was not working out of Dearborn by that time and never even saw this Boss 302-powered GT350. At first the owner, who has a beautiful website wanted to call it a prototype but reports are that Shelby felt better about the term “pilot car,” because this was still a standard Boss 302 albeit with Shelby fiberglass and equipment, including front fenders, a grille, a hood, foglamps, side scoops, special interior trim, a rollbar, and other Shelby-specific features. 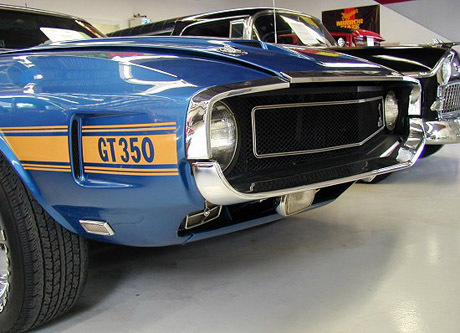 One clue that the bodywork was originally planned to be a Shelby is that it still has the factory-drilled firewall holes to plumb wiring to the foglights that were standard on the Shelby but not on the Boss 302s. Another owner of the car before the restorer found a set of Shelby wheel centercap decals and an extra foglight switch under the original carpet. Usually prototypes have some pictures that were taken by the automaker deep in the company’s files. 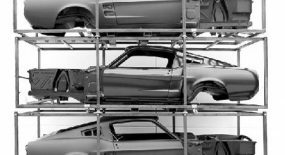 But when George Huisman, a previous owner of the car and owner of Classic Design Concepts in Detroit, dove into Ford’s archives he had no luck. One explanation for this might be that this was an “end run” around Ford management. Shinoda angered Ford designers by reporting directly to Knudsen, ignoring the chain of command. So maybe no pictures were taken because they didn’t want to tip off management until they saw how the car turned out. One unusual feature is that the car is the only known ’69-’70 Shelby with manual steering. Its history since it was a Ford-owned pilot car has been patched together. It is believed that it was a Ford pilot car for only two months then a Ford engineer bought it, disguising it by removing all the Shelby-styled body parts. Of course some bits remained included the interior, the rollbar, the roof snake badges, and five-spoke Shelby wheels. But that would only look like an ultra enthusiast who owned a regular Mustang but was a wanna-be Shelby owner. That engineer is reported to have kept the car for about a decade before selling it in 1979 or 1980. And then, unbelievably, the car began what almost looks like an All-American tour, going from one owner to another, a dozen in all before it landed with the owner who has restored and documented it. 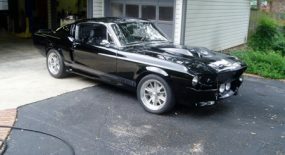 It was when it got to Indiana that its specialness was recognized and it got its Shelby bodywork replaced. The owner was so meticulous he was able to get sheet metal that was stamped within two weeks of the build date, meaning that even if it was a new panel, it could have been built within two weeks of the original. 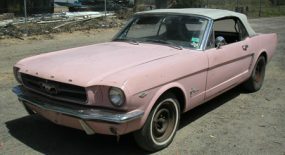 As the author of a series on barn finds, I’d very much like to include this car but there’s still a lot of questions I’d like to ask (I wrote the webmaster of that site, but no answer was received) , such as: “How much did the Ford engineer who bought the car from Ford disguise the car?” “Did he change the body panels to regular non-Shelby ones?” and “Why did Ford not consider it for production?” Are there any Mustang fans out there who remember coming across this car before it became a famous barn-find? 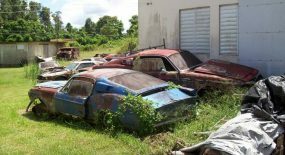 There’s a lot of mysteries in the muscle car world and this is one of them….